In 1929, the automotive industry was as hot as the Internet was in the 90's. The people who led the major companies then were as well known as Jeff Bezos and Bill Gates are today. One of them was Walter Chrysler, who wanted to build the tallest building in the world, to be named — of course — the Chrysler Building. He found himself in a race with The Bank of Manhattan Trust Company, and he won. 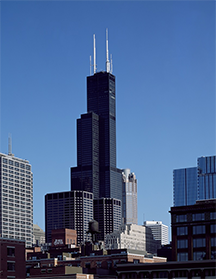 Willis Tower, Chicago, formerly the Sears Tower. Photographer: Carol M. Highsmith, courtesy U.S. Library of Congress. The Chrysler Building, at a respectable height of 1,046 feet, won't stand forever. But nobody has ever deconstructed a skyscraper that tall, and we don't have any idea how to do it. One thing is certain: the cost will be (ahem) sky-high. Since we've given so little thought to minimizing "deconstruction" cost, we now have an installed base of buildings that are stable and safe, but expensive to demolish. So it is with organizational processes. We've designed them to effect management control — to ensure that people follow procedures and to enable management to control cost and quality. But they weren't designed for change, and that's one reason why change is so difficult. How do organizational processes defend themselves against change? Here are three things to do to design processes that are easier to change. We often tie performance evaluation to proficiency in organizational processes, which ties career advancement — and self-esteem — to a detailed knowledge of organizational processes. Once self-esteem is tied to the status quo, changing the status quo can create a threat to self-esteem. No wonder we have trouble. Tie performance to the ability to adapt to changing processes, rather than to skill in following processes of long standing. Reward flexibility, not compliance. Processes have interfaces consisting of forms, contacts, documentation, and so on. To use a process, people interact with it through its interface. When the interface is complex and diffuse, and linked to many other processes, we have more difficulty changing the process. Make process interfaces compact. To avoid reconfiguring the rest of the company when you change a process, keep as much of the process as possible behind the interface. A gatekeeper is someone whose signature you need. For example, most organizations require a supervisor's signature for certain purchases, or for time cards. Some gatekeepers exist because of legal requirements, but many are created for political reasons. Since being a gatekeeper is often a badge of status, gatekeepers tend to resist attempts the change the processes they gate-keep. Avoid creating new gatekeepers. Empower staff to simply sign the forms themselves. For more information about the Chrysler Building, visit the PBS Web site. Would you like to see your comments posted here? rbrenvbjlINTvnMyjqMVMner@ChacrhQWHyNUPPHxhIPhoCanyon.comSend me your comments by email, or by Web form. I offer email and telephone coaching at both corporate and individual rates. Contact Rick for details at rbrenJbwZapIXchhbCwQoner@ChacHifPKxnFakteGPNRoCanyon.com or (650) 787-6475, or toll-free in the continental US at (866) 378-5470.